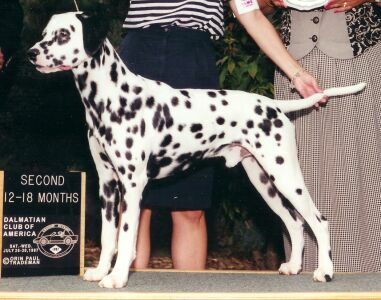 Traffic came to us as a puppy in 1996 from the Canadian ‘TCJ’ kennels operated by Todd Jardine. Traf is a beautifully moving dog and was second to Winners Dog at two DCA Nationals. He also went on to acquire his obedience title with two specialty High in Trials and a tie for another. A very sweet dog with a penchant for stuffed squeaky toys and tennis balls, Traffic now enjoys the California weather and the company of Arthur Greenwald and Emily, his Dally companion.